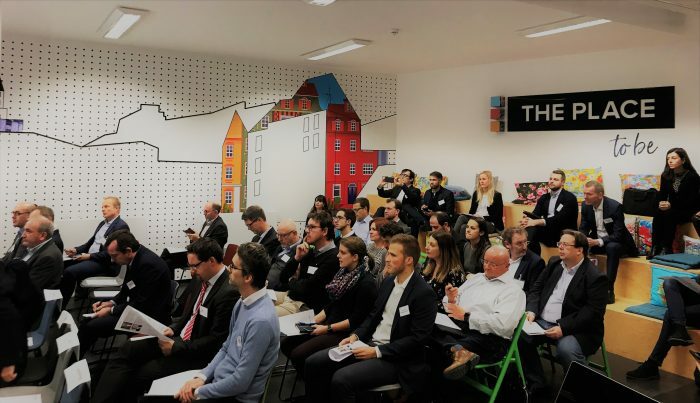 The House of Startups hosted a dozen European startups that came to pitch members of the LOIC (Luxembourg Open Innovation Club). Sponsored by Encevo Group, this event, known in the field as an innovation dating, involves having startups from different industries pitch around a common theme. Selected by the LOIC steering committee, the startups (originating from Luxembourg, France, Switzerland, Germany and Ireland) propose solutions that are potentially relevant to the members of the club. After these presentations, the startups and corporates have the opportunity to discuss the concepts that have been addressed and consider the possibility of collaborating. Smart photonic measurement, data collection, shared fleet management, intelligent parking, virtual guardian angel, building information modeling, light fidelity technology… The startups’ field of expertise varied widely. Their common point? They all use technologies to make the city smarter. Ten startups that were selected demonstrated a wide range of applications in their field. The presentations held by 5micron, CityLity, EnergyElephant, Bim-Y, Moovee, Parquery, MyMedBot, SIUT, Cityrama, and Zero1 thus set the pace of the evening, complemented by two talks. Dr. Eric Dubois, director of the “IT for Innovative Services” department at the LIST (Luxembourg Institute of Science and Technology), gave a complete overview of Luxembourg smart city projects. Then, Laurent Probst from PwC presented the best smart city-startup collaboration platforms in Dubai, Singapore, Israel and Sweden. The LOIC, formed in June 2016 by nyuko, the Lux Future Lab, the Technoport and Luxinnovation, aims to encourage and develop open innovation among large groups and to put them in touch with startups. To this end, it offers several different types of activities for its members; for example calls, workshops, innovation datings, learning expeditions, to name but a few. Already thirty members strong, all of them large groups or SMEs established in Luxembourg in various fields of activity, the LOIC remains open to any business that may be interested.